In 1926 Kallin-Fischer entered the Bauhaus at Dessau where she studied with Paul Klee and Wassily Kandinsky who ran the foundation course. The emphasis was very much on abstraction and there are examples of her work from this time that show she mastered some of the exercises set by these masters, particularly Klee’s course which taught students how to show the sensation of weight as an artistic element, balancing load and counterload. What she did was to successfully apply what she had learned from the traditional figuration of Corinth that emphasised the mass and solidity of the figure to the conceptual strategies of Klee. This adaptability served her well when she moved into Oskar Schlemmer’s theatre workshops at the Bauhaus, where she designed sets and costumes as a way of turning the Bauhaus experience back towards her love of the body. Later she worked with the sculptor Marino Marini, once again emphasising the solidity and expression of the human form. Kallin-Fischer’s photography shows a similar pattern to her work in other media. 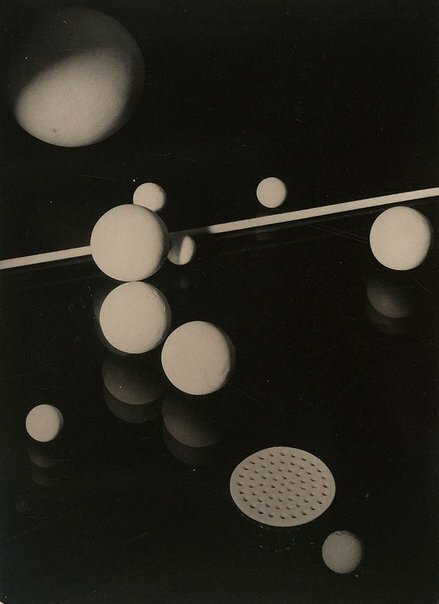 In ‘Untitled (composition with white balls)’ she expresses herself with abstract forms, using oblique line and spheres that suggest movement in space after her theatrical designs. Anthony Bond, Photography: Art Gallery of New South Wales Collection , 'International modernism', pg.93-111, Sydney, 2007, 106 (illus.). Photographie und Bauhaus , Hannover, 1986, 144 (illus. ).